Cook and his number 53 car currently sit in fourth place in the latest version of the Lucas Oil Late Model Dirt Series (LOLMDS) point standings. "It certainly feels great to have back-to-back years with ten or more wins. 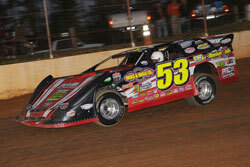 It's the first time in my career I've been able to do that," said the Late Model Dirt Series racer Ray Cook. This is Cook's second year in a row with ten or more wins. The Brasstown, North Carolina native registered his tenth victory of the 2010 racing season recently at Cleveland Speedway in Cleveland, Tennessee. The Southern Regional Racing Series (SRRS) rolled into the historic southern Tennessee venue to sanction a $3,000 to win showdown. Cook qualified well in SRRS group time trials, which locked him into the fourth starting spot in the A-Main. During the course of the 40-lapper, Cook grabbed the top spot on the ninth lap and never looked back en route to the $3,000 victory. "We had a good car and the track was racy for the most part. I was actually lucky to even finish the race, much less win it, as I broke an A-Frame with about five laps to go. It all worked out though and hopefully we can get things to go our way again this weekend, remarked Cook"
"We haven't found anything special to contribute to this, it's just been a great team effort." "In 2009 I merged my team, and now with everyone else involved, well, it's just been great ever since. It's a lot of hard work, but it's worth it at the end. Our success is really only possible because of everyone's involvement with our team. All of our sponsors and product sponsors like K&N are such an important part of our program, and we couldn't do it without them." "We are looking forward to the rest of the year, as this is the time last year when we won about three or four of our big races. 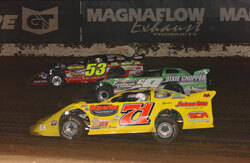 We have the Hillbilly 100, along with the prestigious World 100, all coming up next month. Thanks so much for keeping up with our team and your support," adds Cook. Cook "The Tarheel Tiger" and the number 53 team currently sit in fourth place in the latest version of the Lucas Oil Late Model Dirt Series (LOLMDS) point standings. Cook and his team race next at Lawrenceburg Speedway in Lawrenceburg, Indiana, where he will compete for a share of the $10,000 purse.